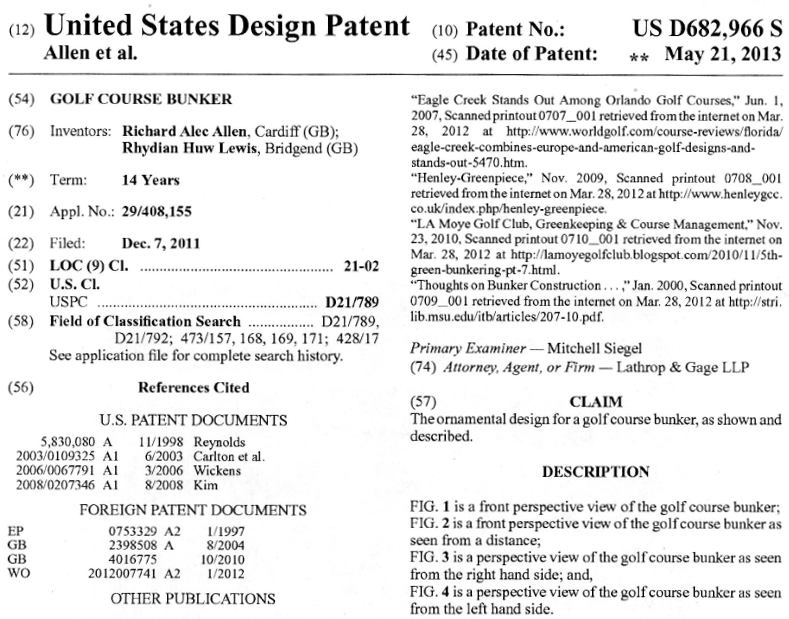 The Durabunker concept is protected by various IP rights, including a number of granted patents and registered designs in several international territories. These patents provide exclusive rights over the appearance and concept of building golf course bunkers having artificial grass turf layered in a staggered arrangement to form the slope of a bunker wall (see, in particular, claim 1 of the patent for full details). These Patents have been subjected to substantive examination by the International Intellectual Property Offices in several international territories. The construction of Gravity retaining structures, Cantilever Retaining Structures with Soil Stabilization is protected under these granted patents. All IP relating to bunker construction using the DURAbunker method is jointly owned (50%) by DURAbunker MD Rhydian Lewis and is used by Durabunker Limited under licence. However, please contact Durabunker Limited in the first instance regarding licensing or other business opportunities. Following examination by the USPTO, the above US Design Patent Application was accepted and a Notice of Grant was issued in May 2013. Copies of the representations as submitted to OHIM (the Community Design Registration Office) can be made available on request. This Registered Design provides rights over the look and appearance of the Durabunker bunker throughout the European Union. The representations as submitted to the UK IPO can be inspected online via the above link. This Registered Design thus provides further rights over the look and appearance of the Durabunker bunker throughout the UK.